Clif Bar, maker of trail worthy natural snacks since 1990, has opened a new bakery in Twin Falls, ID that elevates the company’s commitment to sustainability to a whole new level of delicious. The $90-million facility employs biophilic design, an integrative approach to architecture that places the utmost importance on the interdependent relationships between people and the world in which we live. 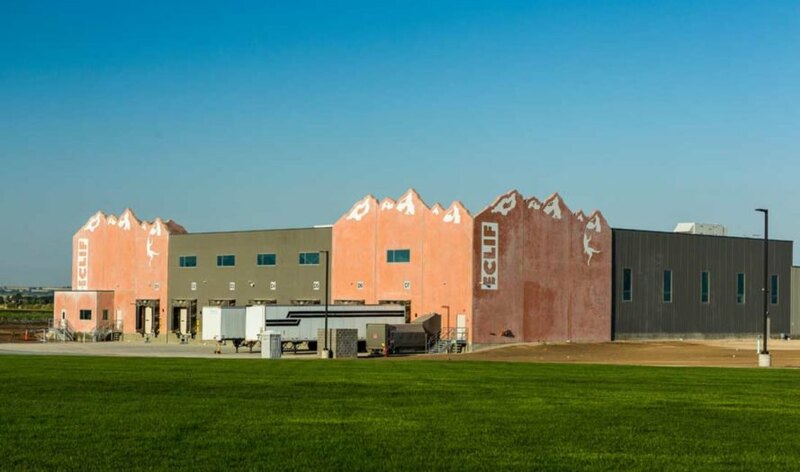 The 300,000-square-foot manufacturing facility is Clif Bar’s first owned and operated bakery, and it features a host of cutting-edge technology to maximize energy efficiency, reduce the company’s carbon footprint, and create a happy, healthy workplace for its employees (who, by the way, are the owners of the company). From an architectural perspective, the building certainly doesn’t look like a typical bakery. Designed by Idaho-based Babcock Design Group, the structure features more than 200 windows, vaulted skylights, and light-directing solatubes to reduce energy usage and limit artificial lighting, making for a healthier and more pleasant work environment. Throughout the interior, locally sourced and reclaimed materials were used wherever possible, including recycled barnwood and Idaho quartzite stone on the interior walls. One main area of the facility features a 3D art wall combining brightly colored phrases promoting the company’s culture, with baking equipment accenting the facility’s express purpose. As a result, the interior has a comfortable vibe—particularly in the employee dining area, where workers can enjoy their meals, socialize, hold casual meetings, and enjoy the expansive views of the campus through floor-to-ceiling windows. The building is also kind to the natural environment. 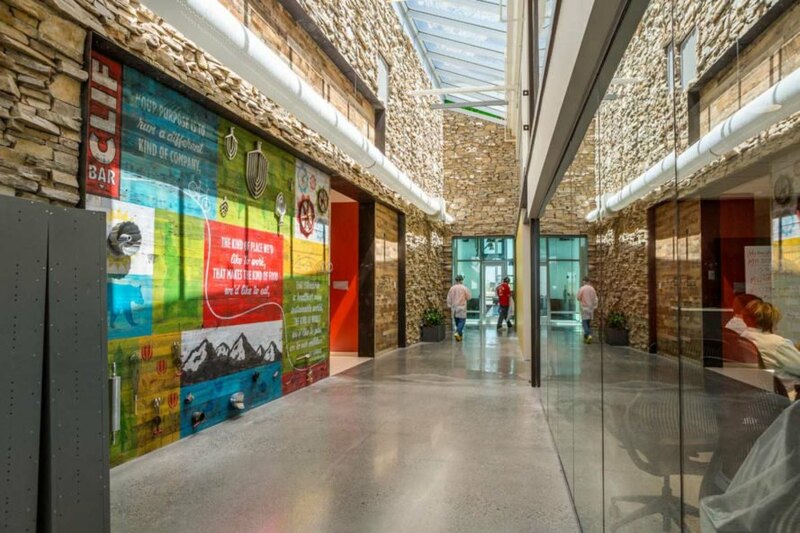 In great part due to its use of biophilic design, the new Clif Bar bakery uses 37 percent less water and 21 percent less energy than most conventional bakeries. Additionally, 100 percent of the electricity used at the bakery comes from green, renewable energy through the purchase of Renewable Energy Credits (RECs) from an Idaho wind farm. The facility also has an onsite water pre-treatment plant, which is becoming a preferred method as opposed to centralized treatment plants. Taking it one step further, the company added a slew of indoor plants, and the building design includes sliding doors that connect an auditorium to an outdoor events space. Employees can lounge on the outdoor patio during breaks, surrounded by drought-tolerant native plants, including more than 570 trees and 5,700 shrubs and grasses selected by landscape architects at Idaho-based The Land Group, Inc. Because the company’s founder Gary Erickson had the epiphany to create Clif Bars after a 175-mile bike ride, the building reflects those cycle-related origins. 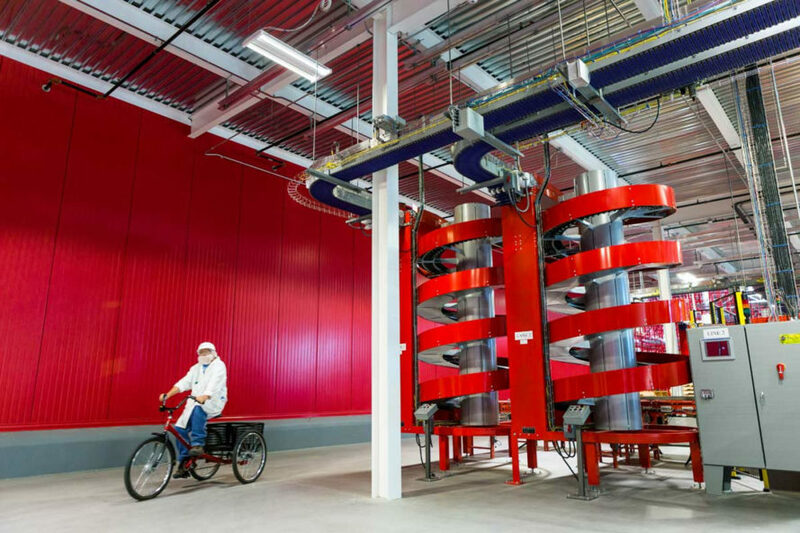 The bakery features an outdoor wall composed of bike-inspired gear shapes, a bike rack for cycle commuters, and indoor trikes to help employees get from one end of the huge facility to the other. Soon, the company will add a bike/foot path and an organic community garden. From an architectural perspective, the building certainly doesn’t look like a typical bakery. Designed by Idaho-based Babcock Design Group, the structure features more than 200 windows, vaulted skylights, and light-directing solatubes to reduce energy usage and limit artificial lighting, making for a healthier and more pleasant work environment. Throughout the interior, locally sourced and reclaimed materials were used wherever possible, including recycled barnwood and Idaho quartzite stone on the interior walls. One main area of the facility features a 3D art wall combining brightly colored phrases promoting the company's culture, with baking equipment accenting the facility's express purpose. As a result, the interior has a comfortable vibe—particularly in the employee dining area, where workers can enjoy their meals, socialize, hold casual meetings, and enjoy the expansive views of the campus through floor-to-ceiling windows. Taking it one step further, the company added a slew of indoor plants, and the building design includes sliding doors that connect an auditorium to an outdoor events space. Employees can lounge on the outdoor patio during breaks, surrounded by drought-tolerant native plants, including more than 570 trees and 5,700 shrubs and grasses selected by landscape architects at Idaho-based The Land Group, Inc. Because the company’s founder Gary Erickson had the epiphany to create Clif Bars after a 175-mile bike ride, the building reflects those cycle-related origins. 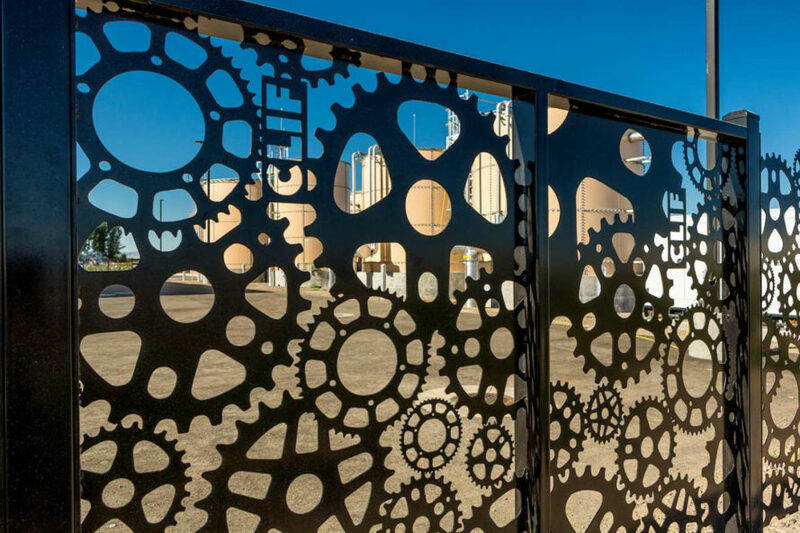 The bakery features an outdoor wall composed of bike-inspired gear shapes, a bike rack for cycle commuters, and indoor trikes to help employees get from one end of the huge facility to the other. Soon, the company will add a bike/foot path and an organic community garden.